Anna Clark has seen the worst in Flint and the best in Flint. In her sweeping new book, "The Poisoned City," the Detroit writer thoroughly documents that city's water disaster and how it reflects "the American urban tragedy." This isn't just Flint's fight. . . . Lead is one toxic legacy in America's cities. Another is segregation, secession, redlining and rebranding. This is the art and craft of exclusion. We built it into the bones of our cities as surely as we laid lead pipes. The 306-page hardback, being published July 10, mixes street-level immersion with deep research into water science, lead’s health effects, Flint's rise and decline, and pitfalls of a businesslike approach to government -- all referenced in 71 pages of source notes. There's also newspaper-crisp freshness -- "In the spring of 2018," a six-page epilogue begins -- and an embrace of the city that doesn't end on Clark's last page. "I feel mindful of the community as this book is published," she tells Deadline Detroit in an extensive email interview. "It’s important to not only be talking about Flint, but to Flint. "It is not just the setting or subject to my book; I am accountable to the truth that they have lived." She talks more about that sense of accountability in interview excerpts that end this article. The Detroiter, a freelance writer from West Michigan who has lived in Detroit since 2007, is graciously magnanimous. "God knows there's room for still *more* books about Flint," she tweeted two weeks ago. And on June 19, Dr. Hanna-Attisha's publication day, a tweet from Clark linked to a promotional page for that writer while wishing "her and her readers much grace, peace, and joy." Early readers admire Clark's narrative, originally titled "Water’s Perfect Memory." "Sober-minded and thorough," tweets author and former Detroit journalist Nathan Bomey. He calls the book "indispensable" and says it has "crucial insight into a disaster that could have—and should have—been avoided." Chad Livengood of Crain’s Detroit Business, who earns a shout for fact-checking help, posts: "It’s a well-written account of the rise of Flint and how decades of abandonment (led by GM) set the stage for disastrous government decisions." Details on two readings by the author are below. The book's comprehensive investigative journalism is impressive. . . . And Clark's narrative voice makes the research come alive like the ongoing story it is. . . .
A cornucopia of history and responsibly researched details is at the core of Clark's work. 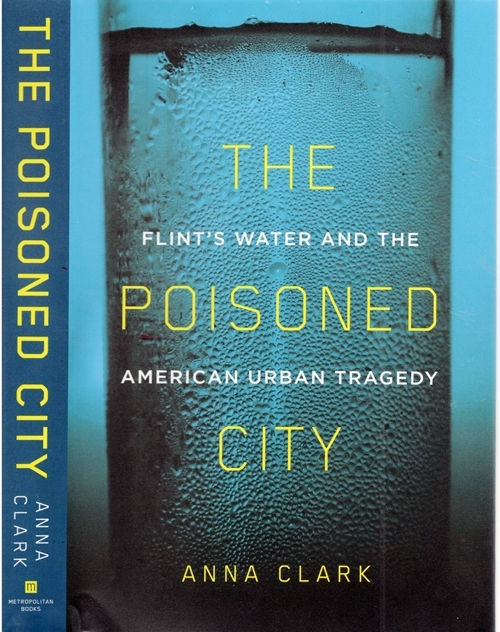 I have yet to encounter a more thorough, accurate or readable account of the poisoning of Flint's municipal water supply than "The Poisoned City." This is an important book, for Flint, for all American cities and for our nation. John G. Rodwan, a Detroit author writing at The American Interest policy blog in Washington, D.C., admires how Clark "details the struggles of making the problems of invisible people visible." Clark's underlying conviction—her faith, if you will—is that facts matter, and that if facts are revealed, problems can be resolved, and those responsible for causing them can be held accountable. . . . She makes her case not only through meticulously documented research . . . but by explicitly documenting how this sort of thing happens, using Flint as a sort of case study. Speaking of affected residents, the author says she was mindful of "treating people with respect in all my interactions with them." "Like so many others, I should have been there sooner. When I reached out to people for interviews, an apology was in my voice," Clark adds in the interview, which touches on her topic's longevity, her bond with Flint residents and how she tried "to cut through the numbness and fatigue." "For a thousand reasons, this is a story that resonates beyond the borders of Flint," says the author, ticking off eight keys reasons: "Environmental justice, community organizing, infrastructure, race, public health, local journalism, the recovery of our waterways, urban policy. . . . I make the case that if Watts came to embody the urban crisis of the 20th century, Flint embodies that of the 21st." What happened in Flint reveals a new hydra of dangers in civic life: environmental injustice, the limits of austerity and urban disinvestment. Neglect, if turns out, is not a passive force in American cities, but an aggressive one. While there is moral cowardice in the story of Flint, there is also heroism, It's found most especially in the lionhearted residents who chose, again and again, to act rather than be acted upon. They turned themselves into top-notch community organizers and citizen scientists, and they built relationships with a diverse ensemble of professionals—including journalists in Detroit and Ann Arbor, a regulations manager at the Environmental Protection Agency in Chicago, an engineer who was working from her suburban home, a pediatrician at a local hospital, and a team of scientists and civil engineers all the way down in rural Virginia—to make themselves visible. This city did not deserve what happened to it. Neither does any other shrinking city. Half a century after the Kerner Report tried to inspire a new approach to American cities, we are at another crossroads between how things were once done and how we can choose to do them in the future. . . . If only some have good, clean water and others do not, the system breaks down. It isn't safe. The community gets sick. 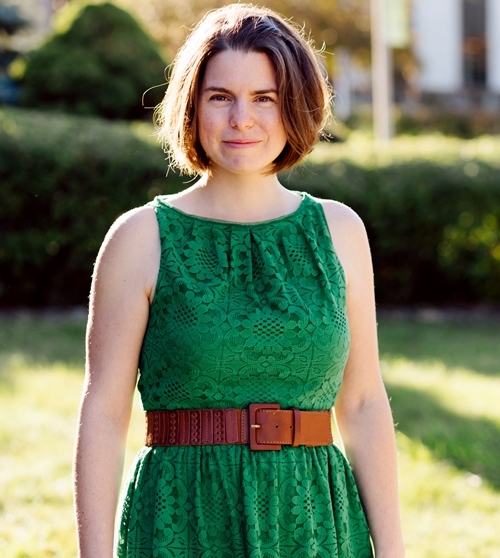 Anna Clark: "I feel mindful of the community as this book is published." Q. What may surprise many readers about Flint’s crisis? A.: That there’s a lot more behind the water switch than just an interest in saving money. That the Flint River itself wasn’t the source of the toxicity. That community organizers and residents were researching, documenting, and amplifying problems with the water immediately after the switch—beginning in May 2014—and were providing neighbor-to-neighbor aid, well before most professionals and outsiders took their concerns seriously. And, although the past half-century has been very hard on Flint, it might surprise people to know that the city is full of life. The chronicle of all that Flint has lost can blind people to what it has: vibrant and thoughtful people, a resurging downtown, new playgrounds, a robust cultural center, eclectic community programming, college campuses, a strong organizing ethic, and visionary work in the neighborhoods that is reimagining what a healthy and just city looks like. There is a reason people love this city, and why they are fighting for it. Q. "Flintstones" had met lots of outsiders with notebooks and recorders. Was it hard to earn trust and show you were up to something different? How'd you do that? A.: If I've learned anything from this experience, it is that trust is something that you are never done earning. Public officials and others working in the community might take note of this. If I'm going to be worthy of trust, I need to be mindful of it every day, even—or especially—now that the book is released. I will say that in the early days, especially, I acutely felt my own lapses. Here I was, a journalist who lived an hour away in Detroit who writes for national publications about cities, the environment, public policy and even water issues. But I didn't start working on my first article about Flint's water crisis until October 2015, 18 months after the troublesome water switch. Like so many others, I should have been there sooner. When I reached out to people for interviews, an apology was in my voice. Also, most people wanted to know what my "angle" was with the book. It's understandable. This is such a fraught story. As a freelance journalist, I don’t have an institutional affiliation, so, for better and worse, I wasn’t able to be categorized. And there had been an astonishing deluge of people that had come to the city—journalists, entrepreneurs, volunteers, celebrities, politicians, documentarians, researchers, the National Guard and more. I'm asking people to share their time with me and tell me their story, and they first wanted to understand where I was coming from. I didn't want to be cagey—I certainly had some thoughts about what was happening in Flint, and I'd already written a number of articles about the water crisis and related issues that gave a sense of them. But I also really resisted coming in with an "angle." Rather than decide on my conclusion before I began, and then reporting only inasmuch as it filled in the blanks of what I already supposedly knew, I genuinely wanted to see where the story took me. It's like the scientific method: You start with a hypothesis, but then you test it, question it, look for ways you might be wrong. For me in Flint, it meant listening as much as I could, reading as much as I could and being as present in the community as possible. It's a good thing too; coming into this with an open and searching mindset made the reporting experience more revelatory, and I believe the book is deeper and more nuanced because of it. While I didn’t offer a pat "angle" to those who asked me for one, I was as transparent as possible about who I am and what I was doing. Doing this consistently helped build trust, I think. Also, giving credit where it is due. Being in touch with people so that they know what happened with the stories they shared. Treating people with respect in all my interactions with them. And I feel mindful of the community as this book is published. 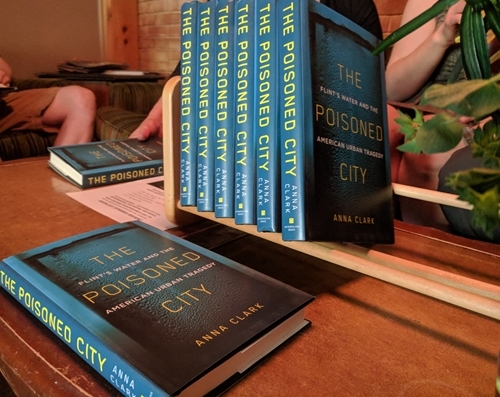 Believing that Flint deserved to see it first, we had a pre-publication launch more than two weeks before the book’s actual release date, with 100 hardcover copies given out freely to residents and free drinks at Tenacity Brewing. It’s important to not only be talking about Flint, but to Flint. It is not just the setting or subject to my book; I am accountable to the truth that they have lived. Q. What gives you optimism about Flint and about our ability to make government more accountable and responsible? A. Flint itself gives me optimism about Flint. It’s a great city. It—and more specifically, its people—should never be counted out. Great things are happening right now, some large-scale and some small-case, but all meaningful. For folks reading this who don’t know the city, I hope they take the time to visit, explore, and build relationships with people and organizations in the community. Learn from them. You’ll see what I see too, I'm sure. And Flint could use more allies. There's no question about how tough the circumstances are. Regarding government, I do think there is some unfinished business. The state recently announced that for the first time in 18 years, no city or school district has an emergency manager. Flint had an EM who held the power of both mayor and city council—along with some additional powers—for 3.5 years, and then was under receivership up until April. I think it is a good thing that the mechanisms of local government are in place again. 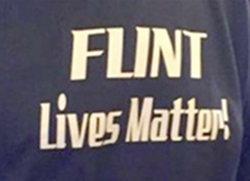 But in Flint, especially, the flaws in our emergency manager law have been exposed. That law has not been reformed yet, despite a great number of investigations and policy thinkers that have explored alternative possibilities. Also, inspired by Flint, there was a bipartisian legislative effort to reform Michigan's transparency laws. But it didn't gain traction. As of now, we are one of only two states that exempt the governor's office and the executive office from open records laws. There are a number of other exemptions and policies that make our government unusually secretive. That doesn’t seem to serve the public well. Q. Was it challenging to persuade Metropolitan Books two years ago that this topic has long legs and broad scope? A. Not at all. That's a big reason why I wanted to work them. I talked with several different publishers in early 2016, but even those that were especially interested in the book proposal wondered about this. Metropolitan didn't. They didn't need to be persuaded on the significance of what happened here; they knew. Environmental justice, community organizing, infrastructure, race, public health, local journalism, the recovery of our waterways, urban policy—for a thousand reasons, this is a story that resonates beyond the borders of Flint. Q. Do you worry that "Flint fatigue" or urban crisis overload may bring numbness or a sense of futility, even among some policymakers and journalists? How can reading your book overcome that? We live in times where it seems like emergencies are happening every day, and I feel overwhelmed by it all, too. I understand how exhausting it is to absorb in one complex and heartbreaking story after another—with real lives on the line, all the time. Policymakers and journalists, especially, can feel an intense set of responsibility to do their jobs well, even when they, as human beings are struggling to hold all the emotion of this. It's hard out there. One way or another, I hope my book will meet readers at the right time. While a lot of the material about the water crisis is tough, the book is riven with historical asides on the Great Lakes, shipwrecks, Charles Kettering, the Sit-Down Strike, the environmental movement and more. Curiosity was my fuel, and I think that’s evident in the pages. There are also a range of eclectic voices here. I tried to bring beauty to the language and craft of the book. And much of Flint’s story, past and present, is genuinely inspiring and beautiful. In all these ways, I hope to cut through the numbness and fatigue.